While this is one of the more expensive products on the DIY language market, it is surprisingly one of the worst. Tell Me More promises hours of video lessons, potentially thousands of exercises, and actually comes with a headset and microphone. While this seems incredibly promising, it just doesn’t live up to the expectation by a long way, with confusing contents and poor voice recognition software making this one of the worst foreign language courses you can buy. Even if it were sold at half the price, I wouldn’t recommend it to anyone really looking to learn a language fluently. There’s the standard DVD-Rom complete with ten levels of study. It’s quite nice to see this sort of course come a little bit more up to date, instead of opting for a multitude of CDs, but that is primarily the only thing in its favor. Tell Me More does offer something called a “Webpass”, which gives you access to a lot of online content instead of purchasing the DVD set. You would think that this would be a good investment, but you only have access for three months. This limited availability really cuts down on the value of it, making it even more of a rip-off. On the DVD are all the usual picture and word games, flashcards, etc, along with some slightly more innovative technology. I’m not denying that this is an impressive selection of software, but the nagging problem is that you just don’t feel like any of them are helping very much. The lack of focus to learning is very problematic, and the ability to learn a language “on the go” via various pieces of compatible technology, while being very impressive, just does not help you learn. On the plus side, you can create your own audio files with whatever you want to be learning at the time, which is an incredibly useful aspect of learning, but not one that isn’t offered by most other courses. There is a fair amount of material here, but then again, for the price you would definitely expect it. The transcript booklet also has lists of grammar and vocabulary, which is invaluable for this sort of learning. Although in certain cases, when listening to the DVD, it would be literally impossible to follow without the booklet and even with the booklet it’s pretty difficult. 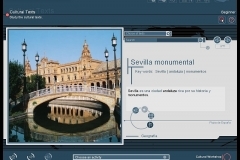 Essentially, what is here is a strong mix of multimedia technology that should help you to learn a language, but unfortunately due to poor planning of the lessons, very much doesn’t. There is a terrible trend among foreign language course to mistake an immersive interactive environment with one of total confusion. Plunging into the deep end with language is not how one learns in a classroom and it is certainly not how one learns when one is travelling or living in a foreign city. It makes very little sense for this to be the way that programs offer their courses at home, and the only reason I can see for it is laziness. A genuinely immersive environment doesn’t leave the learner feeling frustrated, but opens a language up to them in a more realistic and genuine way. Simply not marking lessons properly, or mixing up skill sets so that you don’t know how far you’ve progressed or if you’re really progressing at all, is not an immersive environment, it’s just useless. Tell Me More is very guilty of this. There are apparently ten levels of learning, but these don’t seem to be in much of an ability order. Instead of sequentially progressing through lessons, not only is this course presented in a very jumbled manner, but it is targeted at mixed abilities as well. An example of how frustrating this can be is found in the vocabulary tutoring. When you study a new section, new vocabulary is also given to you. This should prepare you for the section that is to come, but when you actually start to learn that section, there are words that have not been mentioned at all. It clearly assumes that the learner has prior knowledge of certain words, which is frankly infuriating for a course like this. It is also necessary to understand the vocabulary in order to progress, as there is so little information given on certain subjects that you really need to follow everything closely, and trying to go further on instinct is just not possible. On a more positive note, there are some really fascinating additions to the newest version, such as a world map and increased cultural content. It’s this sort of detail, as well as the expense, that makes you think you’re getting a superior product. Unfortunately, in terms of actually helping you to speak and understand a foreign language, Tell Me More just doesn’t quite deliver. Tell Me More claims it will “enable you to speak in minutes”. It is one of the main selling points – the speed at which you are apparently immersed into the language. To be able to give you a grasp on pronunciation is a seemingly impressive claim. 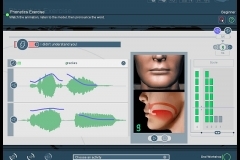 However, I found the voice recognition software, S.E.T.S (Spoken Error Tracking System), to be incredibly troublesome. I am a native speaker of Spanish and found that even my voice was not recognized as it should have been. When a program does not allow for accents or even a slightly different speed of speech, then it isn’t working as it should. You can say a word the exact same way as the CD speaker, and it will still accuse you of speaking too slowly or incomprehensibly. If this is the only connection that you have to the language you are trying to learn, it can be very disheartening, not to mention it gives you a severe disadvantage in the language itself if you end up learning it badly. Following on from this annoyance is the fact that the speaker on the program, while Spanish, also speaks incredibly quickly. The read-along booklet can help to follow what they are saying, but even this is not useful the whole time. This is part of the previous problem of not structuring the program clearly. By trying to appeal to all levels of foreign language ability, they are really not helping anyone. It would have taken a lot more time and care to do, but organizing the content so that the learner could progress from a simple, slower instructional set to a more natural spoken language pace would be considerably more useful. While this might be a more accurate and “real” method, part of the point of learning at home instead of actually going to a country that speaks the language you are learning, is so you can take your time to get to grips with certain aspects of learning like pronunciation and speech patterns. Tell Me More just isn’t a good program for beginners, for this reason. This is where Tell Me More really lets itself down. To be fair, there really are a lot of exercises, and if the information here was presented in a clearer way then the price tag might be worth it. But it simply isn’t. The content is too confusing to begin to grasp as a novice, and regardless of how much there is to learn, if it can’t be consumed in a relatively simple manner then it makes the whole product just a little pointless. The price tag seems to suggest quality, when there are plenty of foreign language courses on the market that are considerably more comprehensible. I feel I should make it clear that this course isn’t necessarily bad value for money. 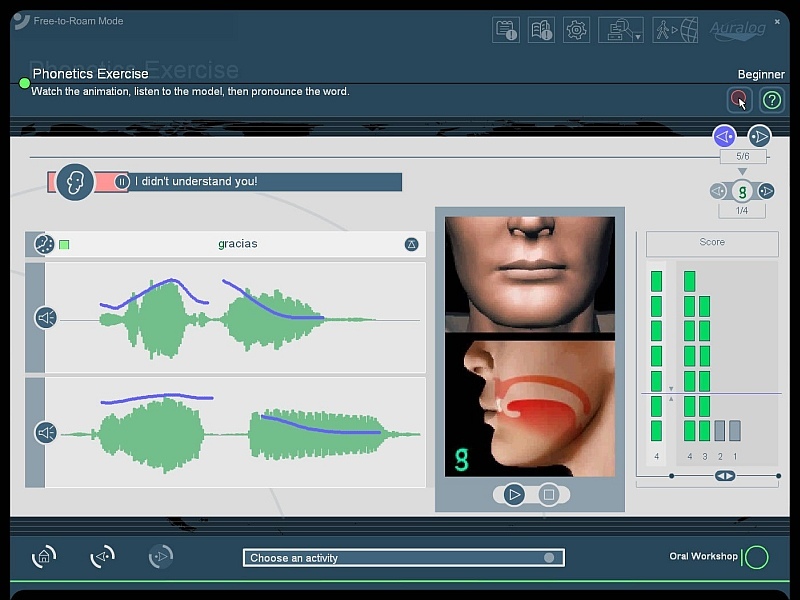 It’s simply that, while clearly a great deal of time and effort have gone into the exercises themselves, not enough thought has gone into making this a program that actually helps you to learn the language. And you can make the exercises as clever as you like, if the language learning course you’ve bought doesn’t teach you the language very well, then it isn’t a good language course, and it can’t be said plainer than that. Plastered all over the advertising for this product are the words “master”. You can “master” a language; this is a “master” course. While there are a great range of interactive activities, the haphazard presentation of this program really lets it down, making it very unlikely that you will actually master the language that you have chosen to learn. Not that this isn’t a very useful study tool, but that sort of thing is not what you would ordinarily spend hundreds of dollars on. That said, if you have that sort of money to spare, and you know that you respond very well to challenging and frustrating material, then there’s no reason why this shouldn’t be as useful as one of the better courses out there. But for the majority of learners, I have difficulty seeing where the positives could be, considering the huge price tag on this product. I discovered that the general application of this language course is very restricted for a complete beginner in Spanish. The user is expected to have some background already in that language. It begins with zero vocabulary establishment or sentence structure activities. The interface is sluggish even if you are using a high performance computer. This is a very expensive piece of language application given that it has poor content. Can’t recommend it for beginners! I was totally excited to acquire this application and give it a test, but it the excitement was cut short as it did not reach to my expectations. 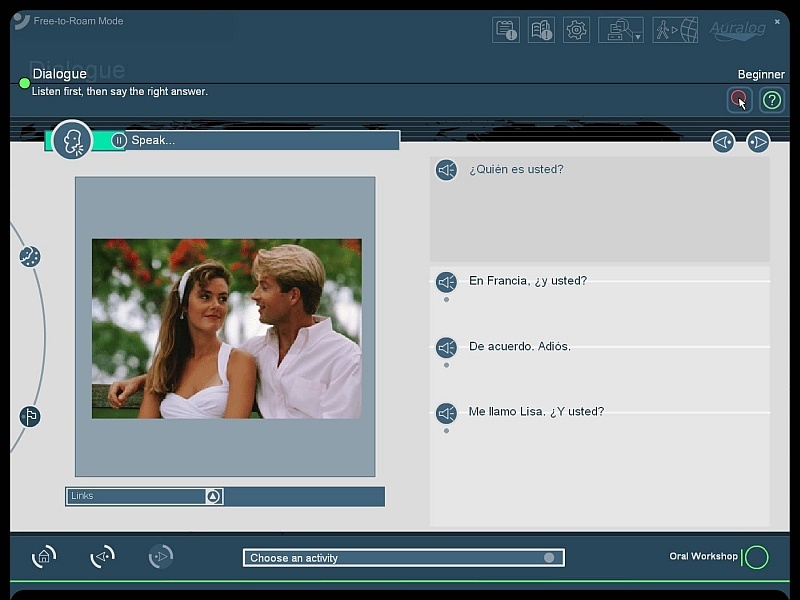 The program is really confusing and it expects that the user already knows some fundamental Spanish, which fortunately I have, or else you will be out of track. The voice recognition which is so valued is the greatest disappointment. Even if you mention the words the same manner as the speaker, it will accuse you that you are saying the words too fast or too slow. I am positive that I am pronouncing the words properly and this program is ridiculous. I have taken 2 Spanish classes during high school. But the speakers in this program uses terms that I totally don’t understand and even the way they say the words are too fast for me to comprehend. Ultimately, this product is not well organized and is extremely aggravating. I suggest that you seek for another language program if you want to start learning Spanish. I have trouble with the process of understanding the language. The program does not distinguish my verbal responses to the questions. What I discovered is inconsistent when I use the pronunciation seminar, which is a portion of the software, I can acquire high marks for the pronunciation of certain words, but still the software cannot understand my replies to the question as well as answer part. Something is really bothering in this software. Sadly there is no one and a half star so I give it 2 stars. I really do not get it on how you will be able to learn something from this material. It is nice for refreshing your present skills but it is not great at teaching. As far as I know it basically concentrates on exercises. I finished Pimsleur, RS, Barron’s Matering German as well as Michael Thomas and fortunately I am satisfied with them. However, Tell Me More did not pass my standards. This language program has several issues. It does not construct sequentially and it provides a fundamental vocabulary for a certain section that is somewhat extensive. That is alright since I love challenges. However, studying the vocabulary is only a portion of the necessary vocabulary in order to be successful with whole process. Fresh words are presumed that are not present in the glossary but the familiarity of which is basic to comprehend the review exercises. I find that strategy to be poor. My vocabulary building exercises are flash cash. 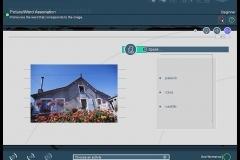 In contrast with other applications like Rosetta Stone, that really applies to program to construct vocabulary and you will see the distinction. Another drawback is the native language speakers. They mention the words so rapidly and unclearly that you cannot even relate to their discussion. I believe their responses are not instructive. That may mirror the fact of listening to foreign speaker but the process of learning should direct the beginners to reality of understanding a second language which this software is unable to provide. Totally confusing, I tried learning some french using the 7 day free sample course. One part of the program showed 3 words then had exercises on different words. The software is not user friendly and the dialogs spoke too fast for me and after a few hours I gave up on this product. The #1 advantage of Language Learning software is the abilty to hear and understand your chosen language. I’m glad I tried the free sample first. This is by far the best program I have used. 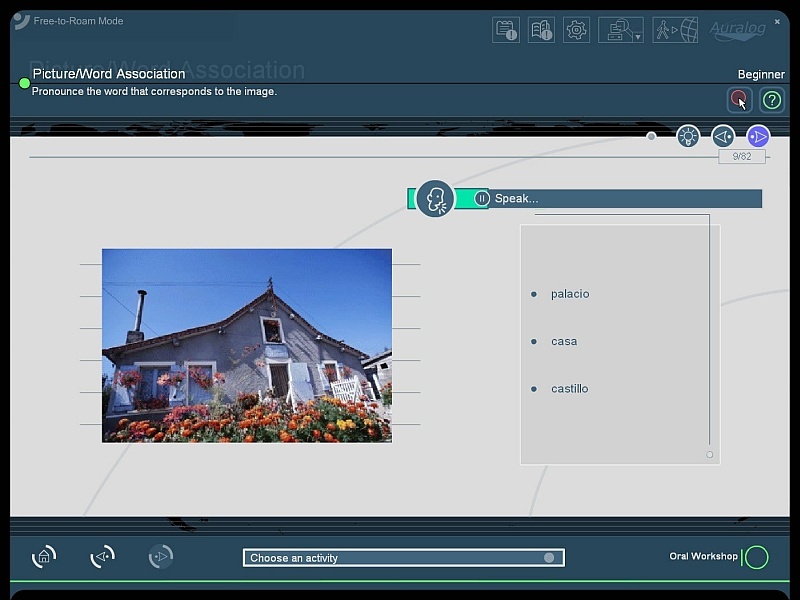 I had tried Rosetta Stone and Pimsleur and really liked the speech recognition component of the program and diversity of activities. I’ve used the German version and I think it’s great. It is frustrating that there is no basic introduction but it tries to teach a language like a child learns to speak. Children aren’t taught random verbs and nouns, they learn by listening and repeating. The speaking portion is a little frustrating but it forces you to actually pronounce the words correctly to move on. 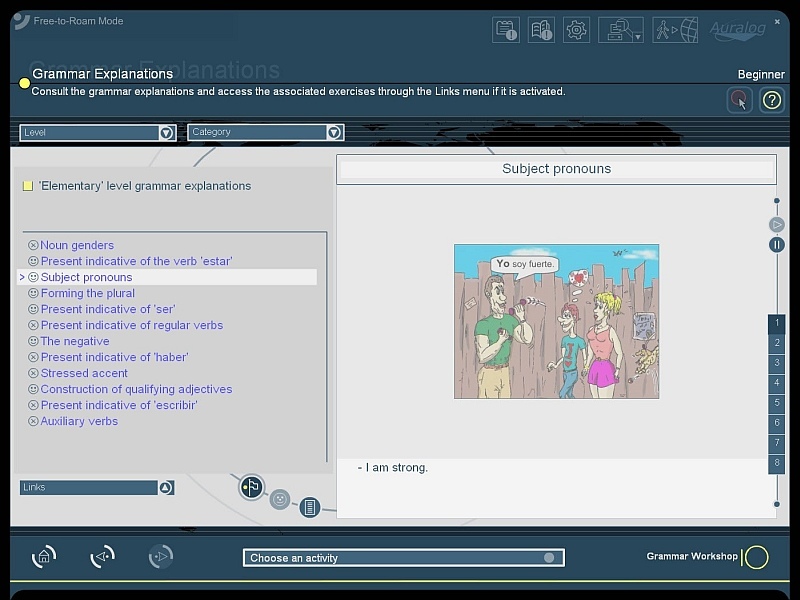 It tries to teach you how to NOT speak with an accent. It’s expensive and not as easy to get into for a pure beginner but it’s great in the later levels. Extremely disappointed with TellMeMore! Currently unable to complete speech recognition activities or submit recorded assignments. My computer hardware has been tested and works fine–the problem appears to be a glitch with their software program. Voice recognition appears to pick up sound during recordings but does not “process,” graph or score them. Even tried using a USB headset with microphone per their tech’s recommendations as well as using a different browser. Currently have a Level 2 Help Desk support ticket out to Rosetta Stone technical support. I may hear back from them within 24-48 hours; meanwhile, the clock is ticking. 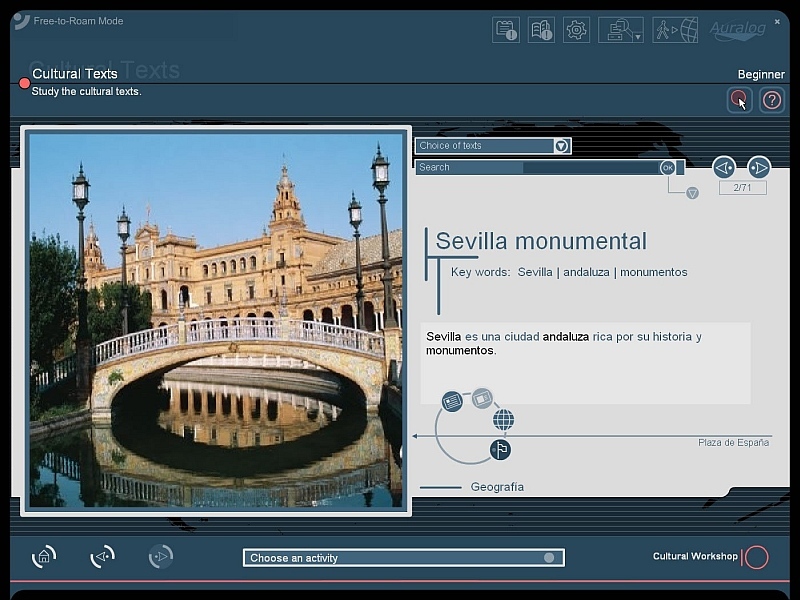 I am using this program for a Spanish class I am taking online and getting farther behind in my assignments. We’re currently using this in our Speech Communication course in college. I agree with most of the comments ere. I didn’t like the interface. Also, not user-friendly. It crashed on me 4 times already. Yes, the speaking portion is truly frustrating. Especially when you have to speak long sentences. Of course, I tried my best to imitate the sample speaker as close as possible… but still, it gives me a negative feedback. I didn’t know it’s that pricey. I think it’s a rip-off for beginners. Overall, t’s okaaaay. I wished there were more activities. I am a native English-speaking American. I’ve learned multiple language via “baptism by fire”, a.k.a. total immersion, both in a particular area of the world and in classroom settings. Although strange for a beginner, Tell Me More teaches a language to mimick how a child learns to communicate. Babies don’t memorize lists of vocab or recite conjugations. They learn through experience with trial and error. This can be frustrating and confusing for an adult because it is difficult to accept this method, as, on the surface, it seems to defy logic. Believe me, I know, and I still struggle sometimes. If the learner would just take the leap of faith and acquiesce to the program’s methodology, he/she will find that the brain’s natural language instincts will take over and suddenly everything will “click”. You will be amazed! As far as the interactive programming is concerned, Tell Me More is training learning to speak the proper, standard form of each language, like you’d hear in a newscast. Already knowing Arabic, I had no problems jumping into the TMM Arabic course as long as I didn’t fall into using a dialect. Same with Spanish. I learned my Spanish in Madrid and had no problems using the TMM program. Please note that tellmemore has been bought out by Rosetta Stone. Rosetta Stone apparently don’t give any discounts for their program just because one has purchased the tellmemore DVD. I chatted with a Rosetta Stone rep and she wasn’t much help at all.